The first jolt came on Oct. 9, when I learned that Pope Francis had named me to the College of Cardinals. The second tremor arrived on Oct. 22, when I received a phone call from the ambassador of the Holy See to the United States, the papal nuncio, who informed me that Pope Francis had appointed me as the Archbishop of Newark, N.J. This assignment was announced publicly today (Nov. 7), and I will be installed in Newark on Jan. 6, 2017. Receiving that second shock, I immediately thought of you, the people of this great Archdiocese whose pastoral care was entrusted to me four years ago. I remembered how you welcomed me, offered your support in so many ways, forgave my mistakes and limitations and always assured me of your love and the precious backing of your prayer. The thought of leaving you devastated me. I have had many sleepless nights and shed more than a few tears. I had always understood my vocation as that of a missionary disciple, one whom Jesus called to be with Him so that He might send me out to preach and heal. Becoming your archbishop, I realized that this missionary also had to become a pastor. The model for all pastoral ministry is Jesus the Good Shepherd, who “knows his own” and his “own know him” (Jn 10:14). Since Oct. 18, 2012, all of you, the beloved People of God, became “my” people. God created among us bonds of love, mercy, forgiveness and joy. Together we accepted our call to work together to respond in love to God, who loved us first. We are an outward-looking Church, asking where God was opening a door. Now Pope Francis has asked me to become a missionary disciple and pastor in another local Church. I hope that you will commission me—send me forth with your blessing to preach and heal in the Archdiocese of Newark. I know that I will leave a considerable chunk of my heart here in the Catholic communities of central and southern Indiana. I trust that God will fill that void with overflowing gratitude for the gift of sharing a portion of the pilgrimage with you. 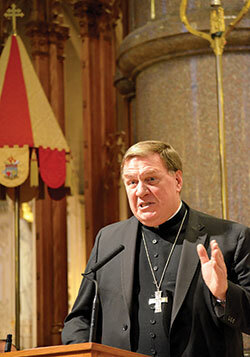 The Archdiocese is not helpless in the face of this change. Just as what happened after the resignation of Archbishop Daniel (M. Buechlein), the Church will provide stable leadership for the Archdiocese until the new Archbishop is named. I believe you will receive a good pastor, and you will not have to wait as long as you did before I was named. You may know that the Archdiocese had already planned a special celebration on Saturday, Dec. 3, to celebrate the feast of our patron, St. Francis Xavier, and to ask a blessing on a new cardinal. Now, that celebration will also be a moment for us to say goodbye in faith. We will remain united in the communion of saints as well as in the breaking of the bread.